Celebrating the 50th Anniversary of the Delano Grape Strike. 50th Anniversary Delano Grape Strike Women's Shirt - Huelga! 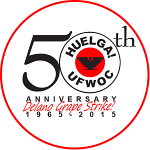 50th Anniversary Delano Grape Strike Men's Shirt - Huelga! 50th Anniversary Delano Grape Strike Umbrella. 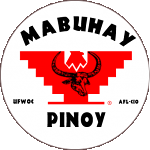 50th Anniversary Delano Grape Strike Patch. 50th Anniversary Delano Grape Strike Button. 16 oz plastic cup with lid and straw.